What is causing young people to take up writing as a kind of meditative practice? Is it a reaction against the extent to which computers and consumer electronics have taken over our lives? Or is it the gradual waning of interest in adult coloring books? The surging popularity of practicing penmanship has swept the online, publishing, and fountain-pen industries in recent months, and even engendered the birth of a new handwritten font industry. Rejecting the uniformity of the age and the impersonal virtuality of computers and mobile devices, many people have begun turning back to writing by hand as a means of imbuing their lives and communications with greater warmth, personality and sincerity. Fortunately, the golden age of writing by hand has not passed beyond hope of revival, and a new enthusiasm for pen and ink has arisen among young people online. “The Fountain-Pen Lemmings Brigade,” or “Lemmings” for short, is a Facebook group founded three years ago as a forum for young people to share their work in pen and ink. 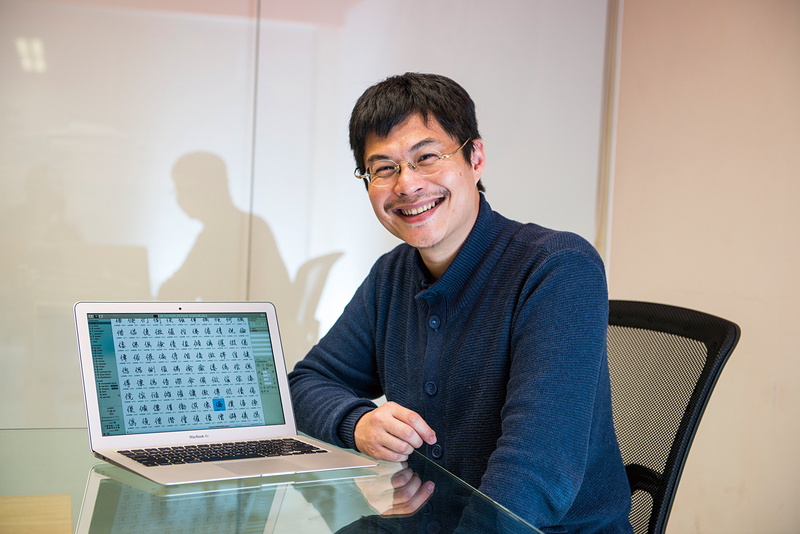 Yan Lizhong, the group’s founder, says that the Lemmings are a pretty nerdy bunch who often show off their collections and their work to the group. The Lemmings’ basic model is for members to write bits of encouragement or moody thoughts with a fountain pen and share them. Detail-oriented posters will also append the brand and color of the ink and stationery they used, while others use drawings of cute animals to give their posts a little extra character. The Lemmings include any number of individuals well known for their penmanship, Ethan Yeh among them. 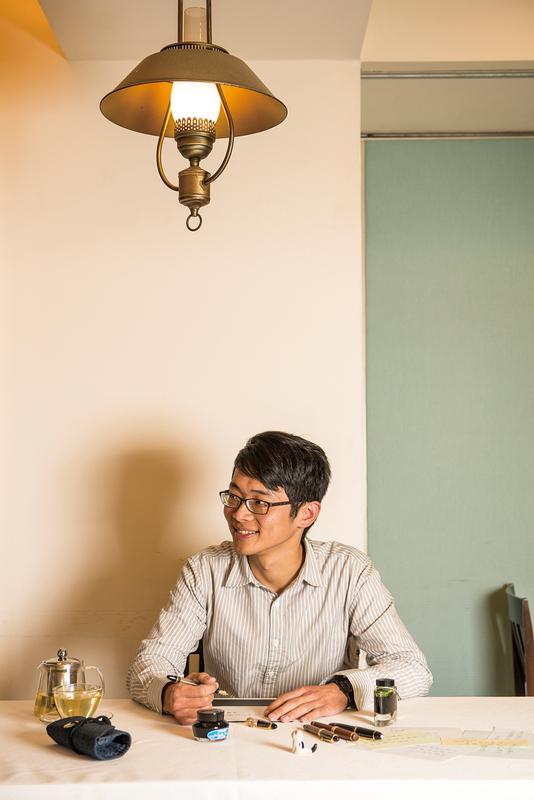 Ethan Yeh, a middle-school art teacher in his 30s, not only has lovely handwriting, but is also a champion calligrapher. 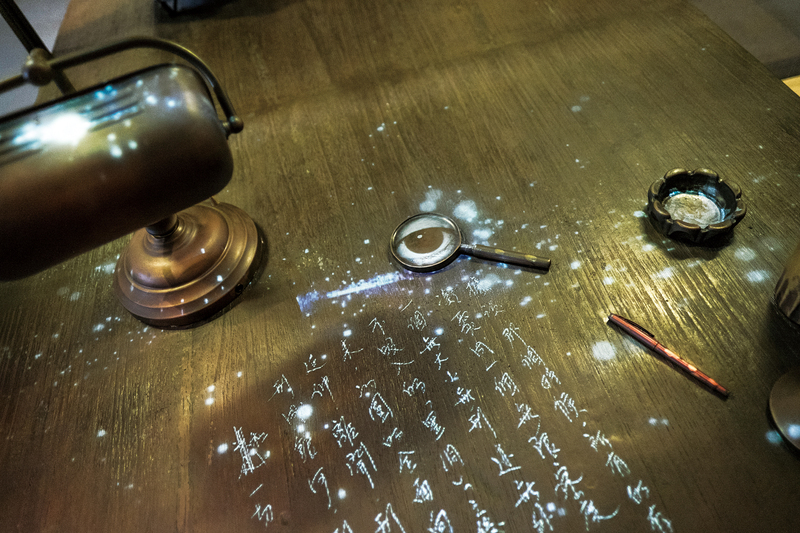 In fact, he has won the National Taipei University of Education National Pen-based Calligraphy Competition’s xingshu (semi-cursive script) prize five consecutive times, and its kaishu (regular script) prize once. Yeh’s business card describes him as a “nightly writer.” It’s an accurate description: he really does sit at his desk every night, quietly practicing his penmanship for 30 minutes or an hour. “Calligraphy means a great deal to me,” says Yeh, adding that he finds writing similar to meditation or Zen practice in that it gives him a sense of transcendence. 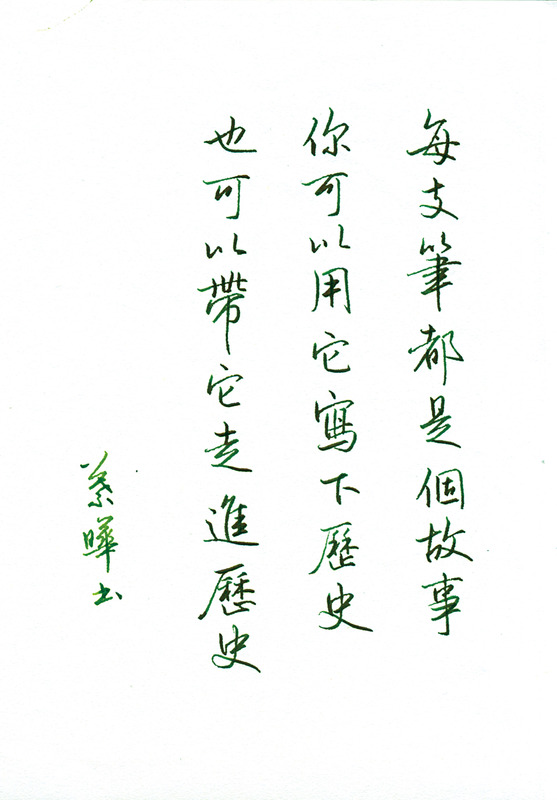 But the pleasure Yeh takes in writing isn’t limited to his solo practice: he also enjoys teaching calligraphy. With that in mind, he’s created his own Facebook page, which has gathered more than 8,000 followers in just a few months. 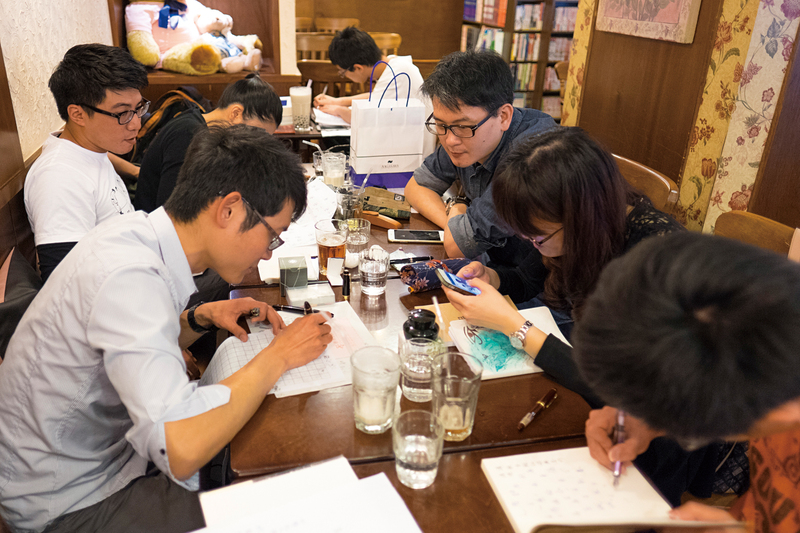 A middle-school homeroom teacher, Yeh has gotten many of his students interested in penmanship. “The students see what I’ve written in their contact books, and ask me about writing techniques.” He sees penmanship as a way of cultivating a certain attitude towards life: the students in his class with poor penmanship have become interested in improving their writing, and look forward to doing so. Last year’s enthusiasm for coloring books has subsided and been supplanted by a new copybook craze. Sun Color Culture was the first publisher to sniff out the trend. Summer Chou, from the company’s department of sales and marketing, says that the publisher noticed that the protagonists in Korean dramas were beginning to take up penmanship as a pastime. “Looking to the past in search of pretty things has become something of a fashion.” So Sun Color began planning a series of copybooks for Chinese and English calligraphy. The first volume, Daily Writing Practice: Focusing to Write Beautifully, sold very well and rapidly earned spots on the Books.com.tw and Eslite Bookstore bestseller lists for art and design books. 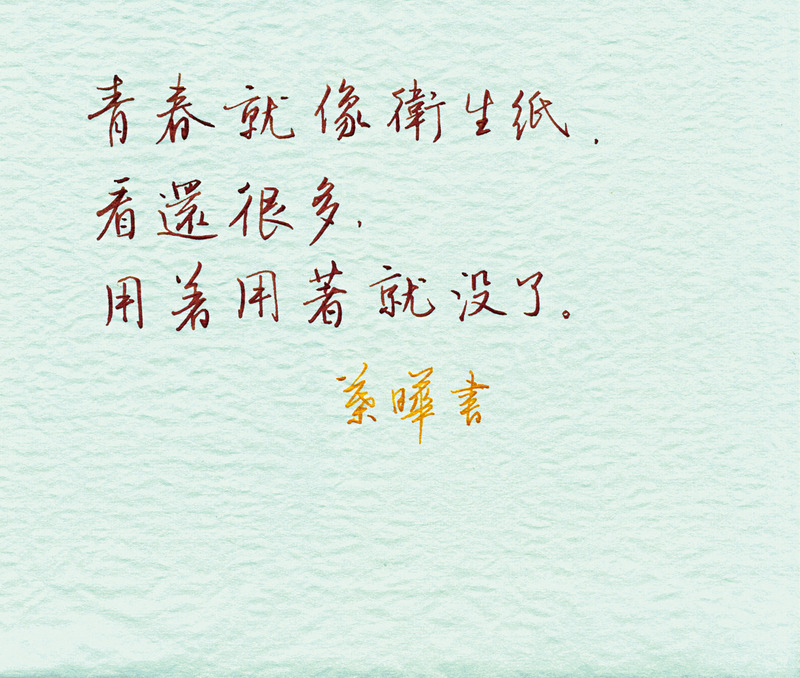 Encouraged by the copybook’s performance, Sun Color moved forward with its next offering, Writing for Quiet Strength: A Calligraphic Heart Sutra. 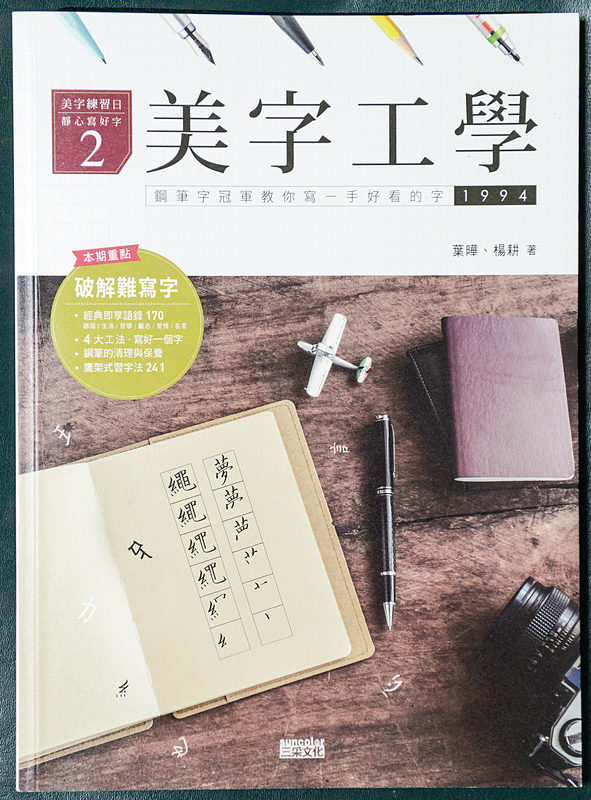 In the introduction to this volume, Li Yu wrote that the scratching of pen on paper calms the mind, enabling the writer to appreciate this most primal of aesthetics. 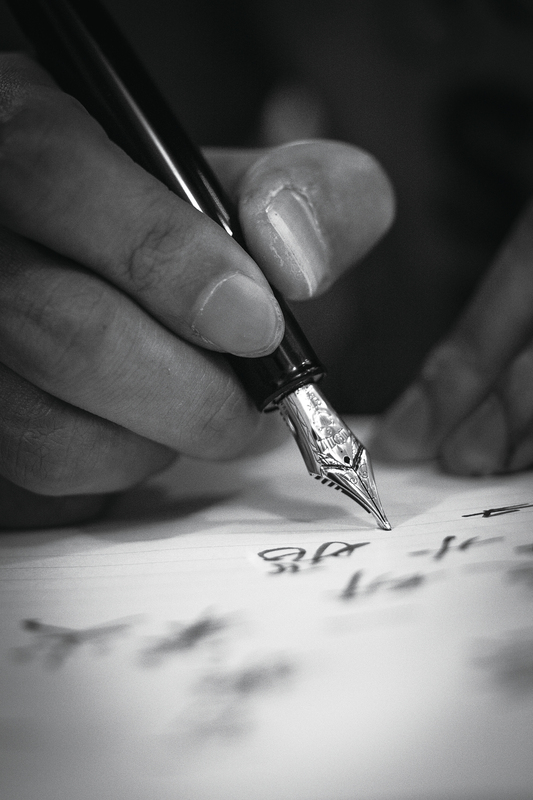 The new enthusiasm for penmanship has driven tremendous growth in sales of fountain pens, ink, and paper. According to one newspaper report, online retailer PChome24h Shopping has seen an eightfold increase in its sales of such products. 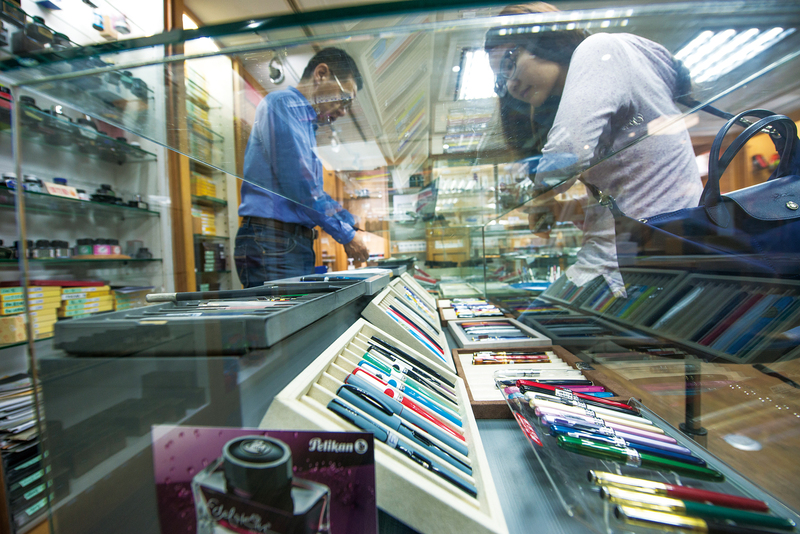 The 65-year-old Lee has a lot of experience with fountain pens. He recalls his family being so poor when he was growing up that he had to write with cheap, off-brand pens that required constant repair. He didn’t begin collecting pens until much later, when he bought his first Montblanc. 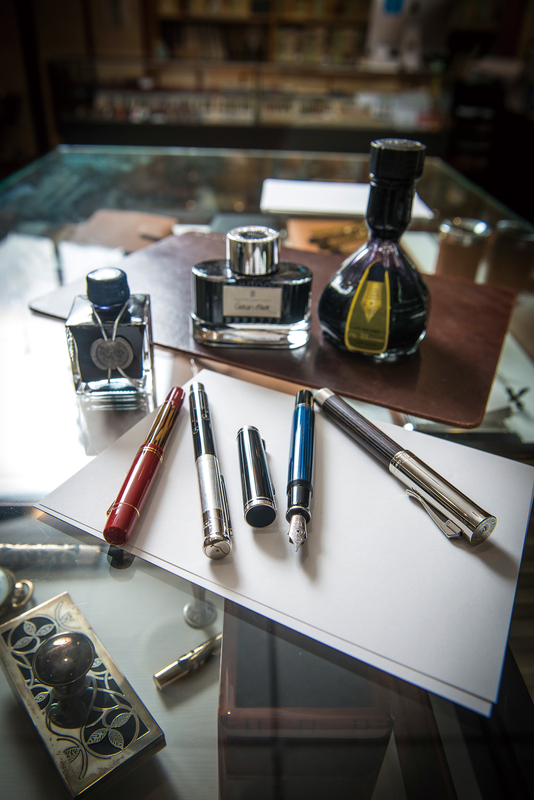 As his collection grew, he became part of the online fountain-pen community and began trading pens with other members. He then went on to open Xiaopin Yaji eight years ago. More than a pen dealer, Lee is also the founder of Pen Cabin, a pen club that that arranges occasional “pen gatherings” and penmanship competitions. 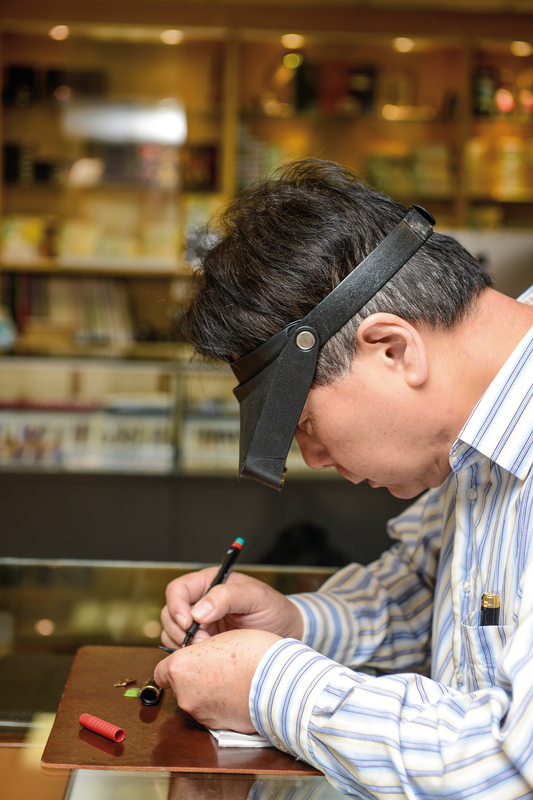 “People pick up a pen and want to write a little something.” Yan Lizhong, who repairs fountain pens professionally and calls himself a “pensmith,” describes pen collecting and penmanship as a lifestyle. The two interests are closely connected, and some hobbyists end up catching the “stationery bug.” “The Lemmings club has a branch they call the ‘plague zone,’ where people with the stationery bug go to trade.” Yan himself has one or two hundred pens and jokes that his own “illness” probably warrants treatment in an intensive care unit. The craze isn’t limited to pens. Inks are also becoming far more diverse. In the old days, you had basically three color choices: black, blue and red. Nowadays, there are hundreds available, luring the Lemmings ever deeper into their hobby. Printed text simply can’t match the warmth of a handwritten note. But wouldn’t it be great if computers could emulate your own personal handwriting? It might not be as far away as you imagine. Last year, a font company called justfont launched the new “justwrite” brand, which focuses on creating characters that look handwritten. Company owner Michael Yeh says he got the idea to create “individual handwriting” fonts from his father’s lovely handwriting. He made inquiries among font makers in Shanghai and Hong Kong, but found either the prices to be too high or the fonts too ugly, and decided to develop the idea himself. Yeh spent more than a year developing his first font. When he ran a trial of his service from October through December 2015, he discovered that far more people than he’d expected shared his vision. He limited the trial to six personal fonts per month, and quickly filled his quota. 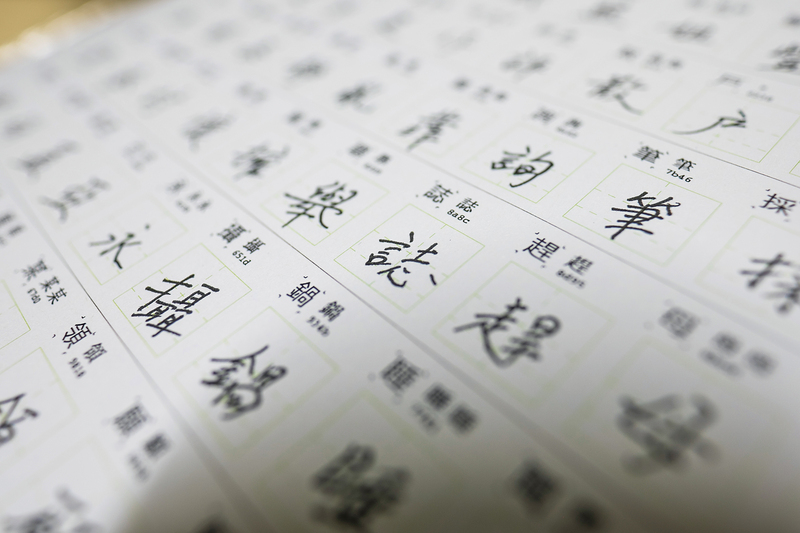 Yeh’s company has since developed more than 100 customized “handwritten” fonts. The first step to creating such a font is to have the customer write 3–6,000 common characters in order of their frequency of use. Justfont proofs the list and makes any necessary corrections before handing it off to justwrite, which removes any smears, recenters the characters, and then uses parameters such as the thickness of the lines and the relative sizes of the characters to create an entire font in the customer’s writing style. When justwrite comes across an especially pretty writing style, the company attempts to negotiate a partnership with the creator to bring it to market. Examples include the Grandma Xionggu, Mr. Eggplants, and Mei-a fonts. And the buzz around Ethan Yeh’s “Yeh Calligraphy” font has already generated more than 300 pre-sales. Interestingly, the text on pop star Cheer Chen’s Songs of Transience DVD was written using the personalized font created for her by justwrite. The company is currently in talks with the singer to release a font based on her handwriting. While some people aren’t terribly interested in writing by hand, others are dedicated to the practice and find it deeply engaging. “There’s no culture without the written word,” says Ty Lee. “People today are incapable of writing a thing without a computer.” He believes that we live and die by the Internet nowadays, and, for all that the Lemmings are encouraging young people to write by hand, they are doing so via the Internet. Lee enjoys teaching penmanship and has been doing so with increasing zeal. He has also developed a 30-minute method for improving people’s handwriting. “It’s hard to change people’s writing style once it has developed. You have to get them to cast away their old style and start over.” He asks them to completely abandon their original handwriting, and has them practice writing in a flat and broad style to break their old habits.